forager, food-forest keeper, author, human. 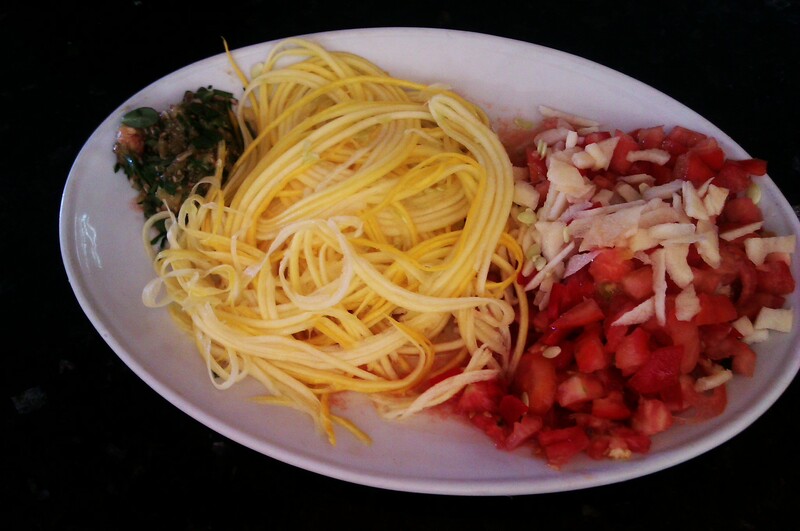 Raw Yellow Squash ‘Spaghetti’ (using a spiral slicer) with tomatoes, sweet peppers & apple, plus breba fig (2), chives, mint, purslane & oregano pesto. All freshly picked from garden. I demonstrate another water curing method with olives I foraged for. This method is harder work than the previous method I demonstrated, but the olives will be ready to eat much sooner. A lot of people don’t eat salt, so this is a healthier alternative to eating traditional olives. The more you change the water, the quicker they’ll cure. If you only change it once a week, it’ll take at least 4 weeks. If you’re changing it twice a day, they’ll be ready much sooner. You’ll notice the water will change colour to purple very quickly. When the water begins to remain clear for a couple of days, taste an olive and see if they’re ready. It’s up to you how much to leech them. I personally leech until all the bitterness is gone, but some people like them slightly bitter. Different sizes and varieties might have varying results. The shelf life of olives made using this method will be much shorter than with other methods, so refrigerate. Update: 6 months later, and the olives are still good to eat, stored out of the fridge in a dark place. Tomato-avocado-cucumber-lettuce wraps, with figs and grapes on the side. I make wraps like these everyday, varying the ingredients depending on what fruit and greens I have available. For super large wraps, you can use collard greens or chard. My trusty camera phone met with an accident, and the one I’m using now isn’t really cutting it. Sorry about that. Cherokee Purple, Super Marmande and Black Cherry are 3 of the heirloom tomatoes featured in this instalment. A video I started before this one is coming soon, I got set back by the loss of my camera. Foraging for wild figs in the mountains in August. It just hit me that the unidentified shrub featured in this video is a Bay Laurel (Laurus Nobilis), known for its leaves which are used as a spice. I make good use of some pine trees, and make some quick raw vegan cucumber spiral spaghetti using only things I picked from the garden (tomatoes, sweet peppers, mint, basil and cucumbers), as well a few of the olives I prepared in a previous video. The tool I use to make the noodles is a Gefu Spirelli Spiral Slicer, but there are much better spiral slicers out there that won’t make your wrists sore. You can also use carrots to make this meal in the winter, or mix carrot and cucumber. Typically, zuccinis / courgettes are used, but they don’t agree with me, and cucumbers taste a whole lot better. You’ll want to use cucumbers with small seeds, such as the Mediterranean cucumbers I use. I demonstrate the simple water curing method for olives I foraged for. A lot of people won’t eat salt, so this is a healthier alternative to eating traditional olives. They’ll be ready sooner if you change the water twice a day, but if you’re lazy then change it once a day and add a couple of weeks to the curing time. An even better method – If you have access to a running stream, you can just put the olives in a net or a cotton sack and submerge them. Leave them underwater for a few days, and they’ll be ready to eat in record time. If you can’t do without the salty taste, you could also sink them in the sea instead of a freshwater stream. Salsola Soda is one of the most under-appreciated wild plants in the world, that sadly sits uneaten while people are hungry. Unfortunately, much of its native coastal habitat in Cyprus is currently being torn down by developers. Be cool, enter your email.